Until a fateful trip to Atlanta for a social media conference last summer, I’d only known Fried Green Tomatoes as a movie from the early 90’s. This popular southern appetizer was on the menu , so naturally, as a “try-anything-once” eater, I had to give it a shot. I am so glad I did. I’m also an admitted “becomes-easily-obsessed” eater once I discover a dish that I adore. So, while recently working with Chef Roger Mooking to create a line-up of recipes to perfectly complement a backyard barbecue, I asked (insisted) that he try a spin on FGTs with my personal favorite, Kumato®. These decadent discs did NOT disappoint. Their light and crispy crust serves as a tasty introduction to the warm, sweet, tomato inside. Enjoyed by themselves or topped with diced, fresh tomatoes and herbs, fried brown tomatoes might just be the next big thing. And they’ll certainly earn rave reviews at your next summer soiree – so make plenty! Why give green tomatoes all the fried glory? Fry up some Kumato® slices for southern treat with a twist. Preheat a grill to high heat. Place lime halves flat side down on the grill and allow to char. Do not move until charred, approximately 8 minutes. Set aside. Add tomatoes, thyme, rosemary, garlic, salt and pepper to a bowl. Squeeze one half of a grilled lime in and toss to coat evenly. Refrigerate. Heat vegetable oil in a medium cast iron skillet to 325F. Place each the flour, beaten eggs, and cornmeal in three separate dishes. Slice each tomato into 3 evenly thick slices, discarding the tops and bottoms of the tomatoes. Season each tomato with salt and pepper then place slices into flour, evenly coating the slice. Tap off excess flour and place into egg mixture. Once evenly coated, place egg-washed tomatoes into cornmeal. Repeat with all slices. Line a tray with paper towels for fried tomatoes. In small batches, fry tomato slices for 90 seconds on each side, or until golden brown. Remove and immediately place on paper towel lined tray. Season with salt while still hot and wet. 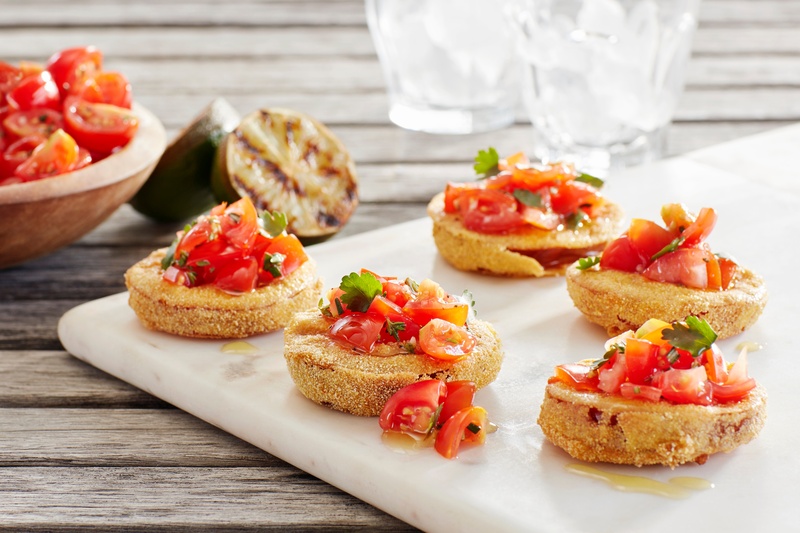 To serve, place fried tomatoes on a large dish, topped with One Sweet® salsa and grilled limes.